Leslie Sauer, a pioneer in the field of restoring and managing native landscapes, and author of the book The Once and Future Forest, will speak at the annual meeting this Sunday of Friends of Princeton Open Space (FOPOS). The title of her talk is Nurturing Nature in the Modern World—Landscape Management and Preservation. Prior to her talk will be a 20 minute meeting in which you can find out more about what FOPOS has been up to over the past year. Afterwards, there will be refreshments, then I'll lead a walk through Mountain Lakes, hopefully including a visit to the newly acquired grasslands of Tusculum, which FOPOS played a vital role in preserving. Ms. Sauer's talk is particularly relevant to Princeton, as FOPOS begins to take an active role in the stewardship of lands it has helped to preserve. Restoration efforts have been gaining momentum this year. FOPOS was awarded a $9000 government grant to restore 4 acres at Mountain Lakes; FOPOS is sponsoring monthly free native plant workshops at the Whole Earth Center; mowing at Princeton's share of the D&R Canal State Park has been changed to allow native wildflowers to bloom all summer long; Princeton High School is converting its new detention basin into a wetland for nature study; and we have started a nursery at Mountain Lakes greenhouse to propagate native wildflowers that have thus far been surviving only in isolated locations around Princeton. The talk will be at Mountain Lakes House. Parking is at the end of the long driveway heading into the woods at 57 Mountain Avenue. RSVPs at 921-2772 are appreciated. Check out the blooms of Spring Beauty as you come down the driveway. 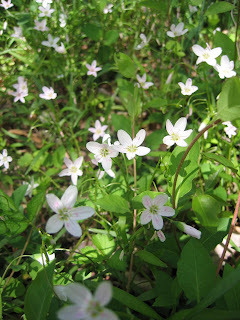 There are two kinds of common native wildflowers blooming this time of year at Mountain Lakes Preserve. 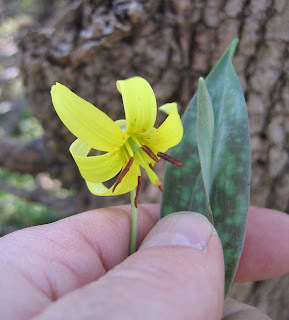 Trout Lily is found mostly north of the lakes. It's leaves are spotted like trout. Spring Beauty lines the main driveway. Both the Whole Earth Center and Earthday turned 36 this past Sunday. I spent the glorious afternoon on the patio at the Center, talking to people about native plants and Mountain Lakes Nature Preserve, and giving away "live stakes" of several native shrub species, along with some locally collected wildflower seeds. The live stakes went well with the live music, consisting of jazz guitar and a female vocalist named Jeanie Bryson, who is also an avid gardener. Many people signed up to receive more information about a sale of native wildflowers coming up next month here in Princeton. If you want to put in an order, email this blog. Live stakes, by the way, are by far the easiest way to propagate three local native shrubs--elderberry, silky dogwood and buttonbush. Simply cut 2 foot sections of the stem before it buds out in the spring, then push the stick in the ground or in a vase half-filled with water. Roots emerge from the lower half, leaves from the top. Lesser Celandine (Ranunculus ficaria), is rapidly spreading into Mountain Lakes from its upstream stronghold at Pettoranello Gardens. Though attractive, its aggressive growth habit is ecologically destructive, as it quickly excludes other spring ephemerals. The end result is a seamless carpet of this exotic species, offering none of the diversity needed to sustain wildlife. 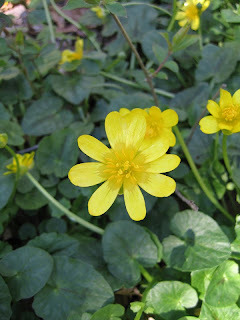 Lesser Celandine is sometimes confused with Marsh Marigold, a native that, like many natives, is rarely seen. 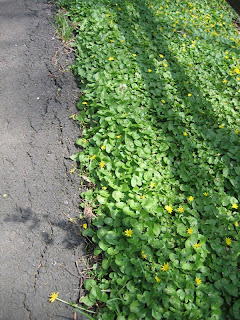 In a month or two, the Lesser Celandine will disappear back into the ground, remaining dormant until the following spring.